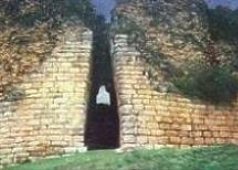 Chachapoyas is a land of a mysterious people whose culture predates the Inca Empire and who were defeated by the Incas in the 1470´s, 60 years before the arrival of the Spaniards. The real name and language of this culture was erased from history by the Incas, but their magnificant cities and fortresses remain to testify to the greatness of the people the Incas called the "sachapuyo" people of the cloud covered mountains. Our journey begins in the jungle city of Tarapoto where we travel by land from the sweltering jungle into the fresh cloud forests of Chachapoyas. With a base in the city of Chachapoyas we will visit the 1000 year old ceramic sarcophagi at Karajia on our first day in Chapapoyas. On the second day we will travel to the great fortress of Kuelap, one of the largest constructions of mankind. On the third day we will travel to the town of Leymebamba with a stop at the musoleums at Revash. In Leymebamba you can visit the local museum that houses the mummys and artifacts descovered recently in the nearby Lake of the Condors. After leaving Leymebamba we will travel to Chiclayo on the Pacific coast where we will visit the Archeological site and museum of the Señor de Sipan one of the most important finds of the coastal Moche culture. During this trip you will have the services of an English speaking guide/translator, a private vehicle and will stay at the best available hotels in Chachapoyas area. For those wishing to also visit the Pacaya-Samiria Reserve the route can be reversed starting in Chiclayo and ending in Tarapoto to continue on to the Reserve. The time for this trip is 9 days and 8 nights. The cost of this trip covers all meals, hotels, entrance to archeological sites and museums, all transportation beginning at the airport in Tarapoto and ending at the airport in Chiclayo.